This 4-Post Adjustable Open Frame Rack with M6 Rails is an ideal solution for mounting network and telecom equipment in a wide variety of applications from a small wiring closets to colocation datacenters. 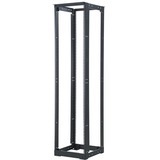 This rack is designed for standard 19in equipment, supports up to 1,000lbs, and features a 5/8in, 5/8in, 1/2in square hole mounting pattern. The depth adjustments may be made in 1/2-inch increments allowing this rack to best fit each application. Constructed of steel, universal L-shaped uprights allow for mounting of sliding server rails and the rack features a self-supporting and self-squaring base along with standard 1/2in junction holes for securing multiple-rack lineups. Notched markers beside hole pattern facilitate counting of rack spaces and the base mounts to rack with the angles facing outward or inward to use minimal floor space. This rack is listed to the UL 1863 Standard for Communication Circuit Accessories and it meets EIA-310 standards. It assembles quickly and easily and allows excellent cable management opportunities.